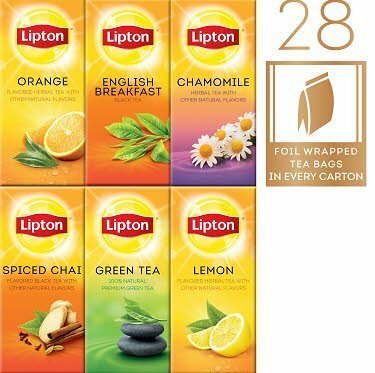 A collection of a variety of fine herbal Lipton teas. Place one tea bag in a cup or pot. Pour in fresh boiling water. Brew between 3 to 6 minutes, based on variety and desired strength. Remove tea bag. Sweeten to taste. Caffeine free product. Variety pack containing 5 unique herbal flavors: orange, chamomile (2), mint, cinnamon apple, and lemon. Packaged in a zero‐landfill facility. Brought to you by Lipton, America’s favorite tea.